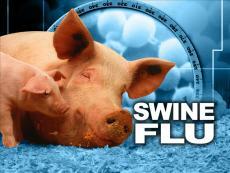 The swine flu killed a few and sickened many. Our hero is determined to come out on top. But all is not what it seems. Fan-Ming had woken up with a fever for five days. Today would be no different, he thought. Another day in bed, being fed porridge, wrapped in down quilt, and asked to “sweat it out” as if he were still a child. He peeked outside his bedroom window. Giant snowflakes were slowly blanketing the suburbs of Toronto. It looked awfully cold. Pei-Hua, his wife, walked in briskly with a tray. A bowl of porridge as usual, he figured. She placed it by his side of the bed, and handed him the thermometer. “Feeling better today?” she asked. “That’s good. See if you still have a temperature.” She handed him the thermometer, and left the room. Fan-Ming popped the thermometer in his mouth, tucked it snuggly under his tongue, and reached over for the TV remote at the far end of the night stand. Just who placed it way over there, he thought. Sure wasn’t me. He felt the beautiful beginning of the day as the TV came on. It was the morning news. They were showing clips of the swine flu vaccine being administered at local schools. He wondered for a second whether Andrew and Audrey had received vaccines at their colleges. They had not called home for weeks now. What if they were sick like their father was. He pulled out his mercury thermometer, and held it in front of him. His eyes narrowed as he scrutinized the thin glass tube for the reading. Slowly his fingers twirled the thermometer around, adjusting for the best angle. There it was, a clear view – 36.8° C, the perfect human body temperature. “Hmm…” he muttered, “it probably needs more time.” He popped the thermometer back in, this time under the other side of the tongue. Sealing his lips tightly, he concentrated all of his energy into an imaginary fireball that hovered around the metal tip of the thermometer. For the sake of accurate measurements, he must do all he can. Pei-Hua walked in again. “Are you still taking your temperature?” she asked impatiently, her gestures almost threatening to pull out the thermometer and read it herself. Fan-Ming waved at her frantically, without saying a word. Of course speaking would lead to escaped heat, which would skew the results. “What’s up with turning on the TV first thing in the morning? Can’t we have some peace and quiet in the house?” Pei-Hua complained as she reached over for the remote. Fan-Ming quickly grabbed it and hid it behind his back. If he could talk, he would be telling her that Regis and Kelly was coming up in ten minutes. “Let me know when you are done so that I can rinse it,” Pei-Hua said as she walked out again, shaking her head. “Oh, and don’t let the porridge go cold!” she called out from the hallway. Fan-Ming carefully pulled the thermometer out between his lips, and read it again. 36.8° C. His fever is gone. He rubbed his eyes in disbelief. How could his temperature be gone? He felt the exact same as the previous five days. Fan-Ming sat back and pondered. Delayed thesis meant delayed graduation. Delayed graduation meant delayed job hunting. Delayed job hunting meant delayed prosperity for the family. He had always been confident that if he were to start job hunting, making a handsome salary in his field was just a matter of time. But the task in front of him was daunting. The semester was coming to an end soon, and he had yet to start his data collection. By his estimate, he was almost two months behind already. Getting back on schedule was next to impossible. He switched his attention to the TV as soon as Kelly Ripa came on. She was wearing a revealing blue dress today, despite the winter chills outside the studio. Regis was smug as usual. Fan-Ming did not care for him much. He never paid much attention to what they said on the show anyway. Since getting sick and having to stay home all day long, he had taken to watching TV every morning, and what was once a never-ending channel surfing exercise stopped as soon as he spotted Kelly Ripa on the screen. The past few days, he felt as if she were with him as he fought courageously against what was surely the swine flu. Fan-Ming skillfully swung the thermometer back and forth, resetting the reading. “Not yet! But still a fever,” he said. He did not know why he said that. It was an unconscious decision. Words were blurted out without having traveled through his brain, which was now entirely occupied by Kelly Ripa. Pei-Hua came in and took the thermometer away from him. “What’s the reading today?” she asked. He could hear her putting on her shoes in the hall. “Goodbye!” he said. “Don’t forget your pills!” Pei-Hua said as she closed the door. Kelly Ripa was laughing at something on the show. Fan-Ming let out a chuckle, even though he had no idea what the joke was about. Thesis can wait, he decided. Prosperity can wait too. This was too good. Fan-Ming was feeling pretty good these days. The fever had long subsided, though Pei-Hua did not know it. The congestion was gone too. Even his slightly ticklish throat no longer bothered him. But he had trained himself to periodically cough a few times in Pei-Hua’s presence. Good acting was required to continue bumming around, watching TV all day and being served meals in bed. He had made many lovely friends recently, in addition to Kelly Ripa. The three magical ladies from Charmed reruns engaged him every afternoon for two hours. Tia Carrere, the Relic Hunter, also kept him company. Pei-Hua still made him take the temperature every day, once in the morning, once at night. At first he would pretend to take it, and reset the thermometer every time before handing it back to his wife. But one night, as Pei-Hua sat in the bed beside him, he did not have the chance to reset it. She took it from his mouth, and read it right away. “36.8° C. You are all good,” she said. Of course, by the next morning, the temperature was back up, and again Pei-Hua prepared his lunch for him as he sat in bed all day. He had wondered whether his wife would start to suspect anything. She was too busy to take him to the doctor, thank goodness. But she was a smart woman with sharp instincts. Sooner or later, she would know something was up. He had to preemptively reassure her of his feeble state. Being a Ph.D student, Fan-Ming was not without his scientific geniuses. One morning, having accidentally taken his temperature after sipping on the hot porridge, he gave himself quite a scare with the temperature reading. The mercury bar had shot all the way to the end. It took him a minute to realize that it was the porridge, not him, that almost blew up the thermometer. While frantically trying to swing the thermometer back down to a more reasonable temperature, it occurred to him that the porridge was the perfect apparatus to fake a fever. Over the next few days, he managed to determine the right amount of time with the porridge in his mouth to achieve a feverish temperature. If he overheated his mouth with the porridge, he would take the thermometer out quickly before the temperature had shot up too much, and use a refined swinging motion in his wrist to adjust the temperature back down to a most believable number. The cheating was more difficult at night, as Pei-Hua often sat in bed beside him, reading her New Yorker while he watched TV. He had to periodically drink the hot water she poured for him, and pop the thermometer in when he was certain that she did not notice. It also required much more skill to control the reading as he could no longer adjust the temperature before showing her. Many times, he volunteered to get out of bed and rinse the thermometer himself. “I got it this time,” he would say. “I need to use the bathroom anyways.” Those were the failed attempts. Christmas was fast approaching. The snow storm had not let up for days. During the day, whenever none of his TV friends was with him, Fan-Ming would sit idly by the window, staring at his neighborhood as if it was a frozen frame in a boring film. His driveway was now almost a meter deep in snow. The neighbors’ kids would come out and throw a few snowballs at each other after school. But they never managed to stay in the cold for more than five minutes. Dirty cars cruised by occasionally, but hardly ever a pedestrian. The tree branches were bare, the sky was gray, and the slushy roads were dark and disgusting. The bleak scene inevitably got Fan-Ming down, as he began to ponder his life at the turn of a half-century in age. He remembered his life in China, before the family of four immigrated to Canada. He was incredibly lucky to have two kids, despite the Chinese government’s one-child policy. Andrew and Audrey were twins. The government couldn’t do anything about that. He remembered the hardship that they all endured arriving in a new country, before Pei-Hua finished her degree and started working at the firm. Life had taken a visible toll on her. The house that he so comfortably lived at now was mostly fruits of her labor. His seven years in the Ph.D program had yielded little more than pocket change. Usually at this point Fan-Ming would be overcome by an incredible sense of guilt. He loved his family, after all. He would think about how he would end this entire charade. One day, he thought, when I feel properly motivated, I’ll finish the thesis once and for all. After the holidays, definitely right after the holidays. Then Charmed would come on, and break his train of thought. Such were the comforts of home that spoiled him for weeks. Fan-Ming was incredibly excited about this year’s family Christmas dinner. Andrew arrived home two days ago from McGill, but that was not the reason. Audrey was not coming back, and though that had upset both Fan-Ming and Pei-Hua for a while, it did not spoil the holidays for Fan-Ming. The truth was, Pei-Hua’s younger sister, Pei-Jing, had recently immigrated to Toronto. Fan-Ming had not seen her for years. Her presence more than compensated for the absence anyone could create. When Fan-Ming was going out with Pei-Hua back in the 1980’s, he had always rather enjoyed the double dates they had with Pei-Jing and her boyfriend. He would become more talkative, take more initiatives, and show more chivalry. Over time Pei-Hua began to notice the pattern, and once asked Fan-Ming about it. Pei-Hua was eager to marry Fan-Ming back then, for she was already fast approaching the monumental age of thirty. And there weren’t any other suitable candidates for her to choose from. With the beautiful Pei-Jing ready to marry her long time boyfriend, the family desperately needed Pei-Hua to get hitched first, thus paving the way for their second daughter to marry. So as much as Pei-Hua questioned Fan-Ming’s heart, she did not pursue the subject further. Two months later, they were husband and wife. The door bell rang, and momentarily forgetting his feigned illness, Fan-Ming rushed to the door. “Hey Pei-Jing!” Fan-Ming said, almost opening his arms for a hug before realizing how odd and suspicious it would be. He saved it with an awkward shrug that could’ve meant a million things, and a handshake. “Wow, that was quick getting the door!” Pei-Jing said, bearing bags of gifts. “Actually I’m much better today.” Fan-Ming said. “Didn’t you still have a temperature this morning?” Pei-Hua asked. “He hasn’t stepped out of the house for weeks,” Pei-Hua added. “You look good for someone who’s been sick for so long,” Pei-Jing said to Fan-Ming. Fan-Ming smiled nervously, not knowing whether Pei-Hua had noticed the same. During dinner the unfortunate subject of Audrey came up. “She has decided to not come home for Christmas this year,” Pei-Hua said matter-of-factly. “But isn’t Brock University only a couple of hours away?” Pei-Jing asked. “Well she was. Now it’s Dramatic Arts,” Fan-Ming corrected her. Audrey had called a few days ago, announcing that not only was she not coming home for the holidays, she was also transferring from English Literature to Dramatic Arts. “It’s all the same. Same useless stuff,” Pei-Hua said. Pei-Jing tried to sooth thing over. “Andrew must be doing well,” She said. Embarrassed, Andrew filled his mouth with half a pork chop. After dinner, with Pei-Hua busy doing the dishes, and Andrew immersing himself in his iPhone, Fan-Ming entertained Pei-Jing over a cup of tea. “What’s happening with the divorce now?” Fan-Ming asked her. He had heard from Pei-Hua that Pei-Jing’s marriage did not work out. “I wish they were all decent like you are,” Pei-Jing said. Fan-Ming almost burned himself with the tea upon hearing that remark. Andrew got up and retreated upstairs as fast as he could. Fan-Ming had forgotten that he was there. When the evening had concluded, Fan-Ming remembered that he had neglected to cough this whole time. “Cough cough!” he let out two loud ones, hoping that it was not too late. The snow storms of December extended into January. Fan-Ming could hardly see his neighbors through his front windows now, for the driveway is almost shoulder high in snow. Not wanting to get in trouble with his neighbors, one day he did try to step outside and shovel. But as soon as he opened the door, the cold air jumped on him like a million agitated snakes, taking bites out of his well-nurtured flesh. So that was that. He had remembered the promise he made to himself that he would go back to his research once the holidays were over. And he did go so far as turning on his laptop, and logging into his email. Prof. Carl had sent him three emails over Christmas, wishing him well and sending him a few papers to read. He saw the word “cognitive” in the title of the first paper and right way his brain turned off. No, he decided, he was not ready for work yet. Pei-Hua had gone on a business trip. He thought she went to Montreal. He wasn’t sure. Her words had gone in one ear and out the other, as they usually do, and Fan-Ming thought the word Montreal was in there somewhere. She had left him some prepared food, but he went through them on the first day. Who knew he would digest this fast without doing anything all day? He had been living on Chinese take-out since then, but the same M.S.G. taste from the lone neighborhood Chinese restaurant that delivered had started to wear on him. He even called up Pei-Jing, hoping she would move to the house for a while and keep him nourished. She never answered. He felt like a troubled man, with a genuine food crisis. The mail had just arrived. Sitting by the window, and peeking over the pile of snow, he watched the mailman drive away slowly. He had not bothered picking up the mail since Pei-Hua left. Why should he? It’s all flyers and credit card applications anyway. Who writes letters anymore? But on this day, a sense of responsibility had re-emerged within him. If he were to impress Pei-Jing, he needed to be the man of the house, and that had to start with picking up the mail. So with that thought firmly implanted in the foreground of his mind, he walked towards the door, and opened it just enough to stick out his arm. Surprisingly, this being the perfect morning hour, the sun was shining brightly against his door, and it was not cold at all. He skipped outside and back in a matter of seconds, with a giant pile of mail in his arms. Tossing himself onto the couch with the pile, he proudly began his pet project of mail classification. Someone had sent him a postcard, to his surprise. “A little late for the holidays, no?” he said to himself in amusement. It was a picture of a sandy white beach, next to the poetically blue ocean, under the sapphire sky. Tall palm trees erected about. In the corner it said Grand Cayman. Ah, Audrey hadn’t forgotten about his father after all, he thought. Flipping to the back, he read the only lines of words written. For the first time in their marriage, Pei-Hua used the words ‘honey’ and ‘love’. It was strange and somehow frightening to Fan-Ming. Why was she not in Montreal? By Montreal, did she actually mean Grand Cayman? Bewildered, he stared at the words for a long time, trying to understand the one person he thought he had always understood. Suddenly he remembered that he hadn’t been sick since December, let alone contagious. How long had she known? When was she coming back? He wanted to ask her but there was no return address. He dialed her phone with his trembling fingers, but it was out of service. Like heavy cargo tossed overboard to save a sinking ship, his heart sank. The cozy house that sheltered him in the ruthless winter was now an enormous and hollow space, indifferent to the chaos in his hearbeat. He was cold and alone. © Copyright 2019 soobacanuck. All rights reserved.